Several recent developments challenge the conventional academic theories that model the governance parameters of the oil exporters of the Middle East. At least nine Middle Eastern governments have partially retracted energy subsidies which provided citizens with cheap fuel, electricity, and desalinated water. What is more, Saudi Arabia, the United Arab Emirates, and Bahrain have imposed a five percent value-added tax (VAT) on goods and services, including energy and food. Other countries, including the three remaining Gulf monarchies as well as Egypt, Algeria, and Iran, have levied VATs or announced plans to do so. For autocratic regimes which fund their national budgets with oil and gas export rents, the imposition of taxes and retraction of subsidies runs counter to social contract stipulations enshrined in the rentier literature. Why? The growing burden of domestic demand for oil and gas has begun to threaten the core rentier structure. High rates of energy demand growth are eventually incompatible with steady exports. Energy subsidies, a core element of rentier social policy, risk undermining the rentier economic structure, the rent lifeline that funds the state. Tax increases and subsidy reforms address the energy intensity (high per-capita demand) incubated by subsidies, as well as aim to reduce domestic consumption and preserve exports. Rentier theory has largely been disengaged with the use of energy within rentier states, including the intensity of that use. Luciani, one of the few early rentier theorists to engage with domestic consumption, wrote in 1987 that oil “has value only to the extent that it is exported.” Minimizing oil’s domestic role was probably justified in the 1980s and 1990s, the classic period of rentier scholarship, when the Gulf states remained underdeveloped and lightly populated. Circumstances have changed. Energy products such as electricity and refined fuels have been distributed for decades at low, fixed prices which have encouraged demand for the domestic oil and gas used to produce them. In-kind energy distribution has, over time, greatly influenced residents’ consumption behaviors and preferences, as well as the physical shape of the built environment. The rentier economies of the Gulf exhibit per capita oil consumption that ranks among the highest in the world. (Table 1) That condition is a direct outgrowth of the pervasive and structural role of oil and gas in the formation of many of these states and their governance bargains, which has imposed deep influences on their institutional design and outcomes. A useful way to envision these effects is as a second stage in the resource curse. Oil rents first helped cement tribal autocratic systems to survive modernization, and those systems, in turn, launched policies that made their states extremely energy-hungry. Oil bolstered autocrats and autocrats bolstered oil. The Middle East has maintained nearly six percent yearly growth in consumption over the four decades since 1973, a much faster rate of growth than the two percent world average. Over time, Middle Eastern oil export economies which faced few pressures to rationalize demand or reduce intensity of use became less competitive on an energy basis relative to importing economies. Availability of cheap oil created distinct physical, institutional, and sociological outcomes in the Middle East, incentivizing wasteful behavior and an energy-intense building and capital stock. These new taxes and subsidy reforms would not seem remarkable in a participatory governance setting where economic and social policymaking sometimes requires corrective retrenchment. But in the rentier Middle East, they run contrary to four decades of scholarship. Academics have long held that the oil kingdoms of the Middle East are subject to a strict set of governance conditions. Rulers cultivate support from their citizens by providing them with welfare benefits and subsidies, funded through export rents. These rents were sufficient to eliminate taxes and other forms of extraction, thus allowing regimes to avoid accountability links with taxpayers. Energy subsidies have been described by scholars as “rights of citizenship,” provided by regimes in exchange for public acquiescence to autocratic rule. Were the state to break its side of the bargain, the theory suggested, the entire pact was liable to unravel. These price increases were greeted by a flood of complaints in social media. In Saudi Arabia, commentary ranged from outright support to personal attacks on ministers, technocrats and even royal family members. Cautious Saudis began tweeting pictures of King Abdullah unaccompanied by text. The portraits evoked the late ruler’s patronage of the poor as commentary on his successor’s turn toward extraction. Physical protests broke out in populous hydrocarbon exporters, including Iran and Algeria, as well as in Oman, where citizens picketed the Ministry of Oil and Gas after gasoline price increases. The outcry over rising prices was met with stepped-up repression in most of the affected countries. The use of mild repression to quell breaches of the state-society pact is predicted by early rentier works, while later writing argues that the state prefers to head off dissent with patronage and consultation. The ongoing crackdowns on speech along with the state-directed murder of a Saudi dissident in Istanbul provided further evidence that benevolent characteristics of Gulf autocratic rule were eroding. These developments suggest that a reassessment and update to theory is due. Rents certainly remain of primary importance to governance in these autocratic export states, but some rules that theorists have advanced over the past four decades now appear more like guidelines; and guidelines can be disregarded when circumstances allow. The subsidy reform that swept the Middle East since the 2014 decline in oil prices is undeniable. Over a four-year period, at least nine countries raised prices on energy products that, in most cases, had been fixed at low levels for many years. Reformers include all six of the wealthy Persian Gulf monarchies (Saudi Arabia, United Arab Emirates (UAE), Kuwait, Qatar, Oman and Bahrain), petroleum exporters Algeria and Iran, as well as Egypt, a mid-sized producer that is currently a net importer. These price increases have been covered elsewhere, but Fig. 1 provides detail. As Fig. 1 shows, the initial increases took place alongside a decline in the crude oil market price, providing a fiscal impetus – as well as political cover – for reform. However, some of the largest increases came in 2018, well after oil prices had recovered much lost ground. This suggests that the subsidy rollbacks were driven by determination to stem demand growth. By late 2018, with Brent prices nearing $85 per barrel, none of the countries had rescinded the increases in domestic energy prices except Oman, where 2017 protests led the government to cap gasoline prices for 10 months. In 2018, the government revived a small gasoline subsidy and restricted it to low-income Omanis, forcing expatriates and higher income citizens to buy fuel at unsubsidized prices. What about the tax increases? In January 2018, Saudi Arabia and the UAE imposed the Gulf’s first-ever value-added tax, imposing an extra five percent price hike on nearly all goods and services. Bahrain followed suit in 2019. The remaining three monarchies have announced plans to impose VATs of their own, demurring on launch dates. The Saudi imposition of VAT, higher utility, and fuel prices was partly offset by the launch of the Citizen’s Account program, a government cash transfer that has provided monthly payments ranging from $80 to $250 to the lower-income half of the citizen population. Where subsidies have not been completely lifted, their provision has often been narrowed to citizens, or even poor citizens, as the examples in Oman and Saudi Arabia illustrate. The UAE and Qatar had long ago split electricity and water tariffs, retaining cheaper (or free in Qatar) power and water for citizens. Bahrain and Kuwait have also developed differentiated prices based on citizenship. So, even as citizens are asked to pay something for a previously free service, or pay a bit more than was customary, foreigners have shouldered much larger increases. These actions appear to violate rentier claims about inviolability of subsidies, even as they conform to academic portrayals of citizenship as a source of economic privilege. The main reason behind the imposition of tax and subsidy reform is the rising consumption of exportable hydrocarbons within these states. Four decades of compounding demand growth now diverts substantial shares of oil and gas away from export markets. (Fig. 2) In 2008, two of the six GCC states – Kuwait and the UAE – became net importers of natural gas. Were demand growth of oil not slowed or halted, some or all of the six countries would see their oil exports – the economic underpinning of all six – put at risk. Documentation of the so-called “cannibalization” phenomenon has been produced by financial analysts and think-tanks, but has yet to be scrutinized in the rentier theoretical literature. All of the autocracies depicted in the bottom right quadrant of Fig. 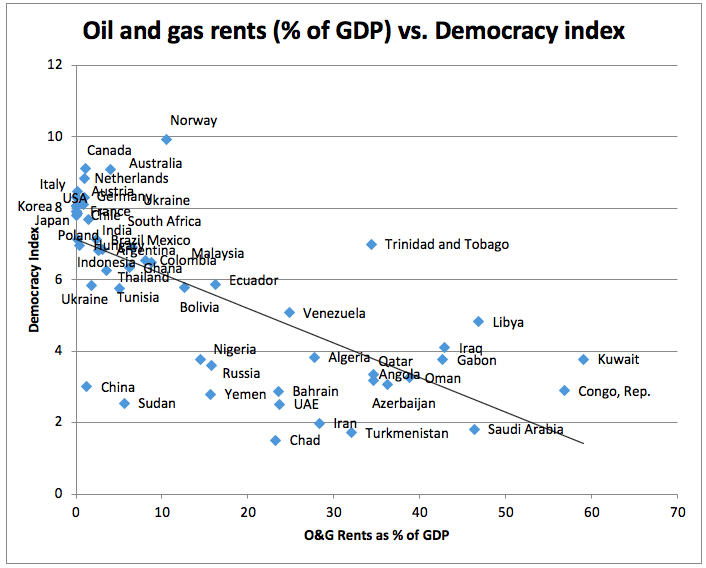 3 (the most energy-intense and least democratic) are oil exporters. 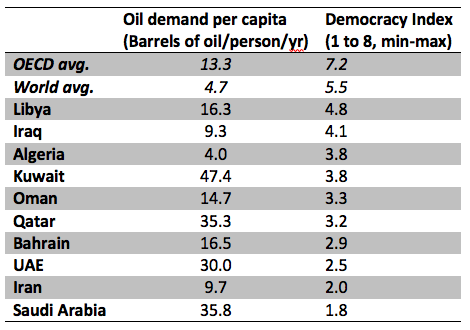 Table 1 also shows that most Middle Eastern exporters were less democratic and consumed more oil per-capita than the average in the OECD and the world. Thus a reassessment of oil’s role on the state is due; not only as an example of an historic omission from the rentier literature, but because energy intensity is a product of rentier governance, caused in large part by the distributive mandates of the rentier social contract. The evidence shows that rentier governments have begun engaging their citizens with energy policymaking in ways that do not follow the script laid out by rentier state theory. Governments which (probably unintentionally) incubated high energy intensity in their economies are now revoking supposedly sacrosanct energy benefits. Citizens are largely accepting their losses without making demands for democracy. These developments imply that rentier theory needs updating. First, as regards subsidy reform, we should acknowledge that the domestic subsidization of primary exports comprises an encumbrance on the economy. Left intact over the long term, domestic resource distribution can undermine the rent stream and destabilize the governance structure. Regimes should be expected to take action to lessen the strain. Second, academics’ central misunderstanding about subsidies is that they are inflexible. By portraying subsidies as rights, theory implies that they cannot be reformed without upsetting stability. On the contrary, I argue that subsidies are ultimately more destabilizing to rentier systems than the corrective retrenchment actions that have occurred since 2014. Citizen benefits can be more accurately depicted as “customary privileges” that may be restricted in ways that once appeared illegitimate: towards low-income citizens or “reasonable” levels of consumption, or replaced by alternate handouts. As long as aggregate patronage remains roughly constant, regimes appear to have some control over the type of welfare goods and services they provide. In other words, social contracts are less rigid than portrayed in the rentier literature. These amendments provide theoretical allowance for the reforms that have already begun in the rentier heartland of the Gulf. Thus modified, theory can anticipate the likelihood for regimes to continue to streamline social welfare policies in the interest of preserving power. How should theory deal with the extraordinary oil intensity of the Gulf monarchies? By acknowledging that the resource curse hypothesis that “oil bolsters autocracy” has a follow-on stage, whereby autocratic policies incentivize domestic oil demand. That is because energy is leveraged as a tool of state development and political control. The practices of rentier policymaking have expanded beyond the boundaries assumed by existing theory. We may be witnessing the top-down imposition of a new social contract featuring increased regime flexibility in social policy, implemented under a heightened level of repression. These developments do not signal a reduced regime reliance on rents or the demise of rentier or “allocative” governance. World Bank data show a continued large role for oil rents in GDP and for rent distribution via public wages in state spending. Instead, the levying of low-level taxation and reductions in energy benefits look more like coordinated course corrections. Regimes are streamlining bloated social contracts to contain the distortionary effects of policies that have remained in place since the 1970s. At that time, poverty alleviation was a much larger concern. Today, oil intensity is a countervailing worry for younger ruling elites updating rentier governance for new generations. Covered in Jim Krane, “Political Enablers of Energy Subsidy Reform in Middle Eastern Oil Exporters,” Nature Energy, April 2018, https://doi.org/10.1038/s41560-018-0113-4. This theme is addressed in greater detail in Jim Krane, “Stability versus Sustainability: Energy Policy in the Gulf Monarchies,” The Energy Journal 36, no. 4 (2015): 1–21, http://dx.doi.org/10.5547/01956574.36.4.jkra; Jim Krane, “Guzzling in the Gulf: The Monarchies Face a Threat From Within,” Foreign Affairs, December 19, 2014, http://www.foreignaffairs.com/articles/142692/jim-krane/guzzling-in-the-gulf. Giacomo Luciani, “Allocation vs. Production States: A Theoretical Framework,” in The Rentier State, ed. Hazem Beblawi and Giacomo Luciani (New York: Croon Helm, 1987), 65–68. Useful works on oil’s historical role in state formation include: Nathan J Citino, From Arab Nationalism to OPEC: Eisenhower, King Saud, and the Making of US-Saudi Relations, Indiana Series in Middle East Studies (Bloomington: Indiana University Press, 2002); Robert Vitalis, America’s Kingdom: Mythmaking on the Saudi Oil Frontier (London: Verso, 2007); Timothy Mitchell, Carbon Democracy: Political Power in the Age of Oil (Brooklyn: Verso, 2013); Toby Craig Jones, Desert Kingdom: How Oil and Water Forged Modern Saudi Arabia (Cambridge, Mass. : Harvard University Press, 2010). For an in-depth review of rentier literature’s prohibitions on subsidy reform, see pp. 67-77 in Jim Krane, “Stability versus Sustainability: Energy Policy in the Gulf Monarchies” (PhD dissertation, University of Cambridge, 2014), http://dx.doi.org/10.17863/CAM.5943. Hazem Beblawi and Giacomo Luciani, “Introduction,” in The Rentier State, ed. Hazem Beblawi and Giacomo Luciani (London: Croon Helm, 1987), 1–21; Jill Crystal, Oil and Politics in the Gulf: Rulers and Merchants in Kuwait and Qatar (Cambridge: Cambridge University Press, 1990); F. Gregory Gause III, Oil Monarchies: Domestic and Security Challenges in the Arab Gulf States (New York: Council on Foreign Relations, 1994). F Gregory Gause III, “The Political Economy of National Security in the GCC States,” in The Persian Gulf at the Millennium, ed. Gary Sick and Lawrence Potter (New York: St. Martin’s, 1997), 61–84; Michael Herb, All in the Family: Absolutism, Revolution, and Democracy in Middle Eastern Monarchies (Albany: SUNY Press, 1999); Gwenn Okruhlik, “Rentier Wealth, Unruly Law, and the Rise of Opposition: The Political Economy of Oil States,” Comparative Politics 31, no. 3 (April 1999): 295–315. Beblawi and Luciani, “Introduction”; Gause III, Oil Monarchies: Domestic and Security Challenges in the Arab Gulf States; Gause III, “The Political Economy of National Security in the GCC States”; Oliver Schlumberger, “Rents, Reform, and Authoritarianism in the Middle East,” in Dead Ends of Transition, ed. Michael Dauderstadt and Arne Schildberg (Frankfurt: Campus Verlag, 2006), 100–113; Rolf Schwarz, “The Political Economy of State-Formation in the Arab Middle East: Rentier States, Economic Reform, and Democratization,” Review of International Political Economy 15, no. 4 (2008): 599–621; F. Gregory Gause III, “Saudi Arabia in the New Middle East,” Special Report No. 63 New York: Council on Foreign Relations, 2011. See case studies of the Iran and Dubai subsidy reforms in Jim Krane, Energy Kingdoms: Oil and Political Survival in the Persian Gulf, Center on Global Energy Policy Series (New York: Columbia University Press, 2019), pp. 98-116. Human Rights Watch, Freedom House and Amnesty International reported losses in civil liberties and political freedoms, and increased state repression since 2010 in several Arab countries, including much of the Gulf. Bahrain and the UAE saw the largest decreases in personal freedom, according to Freedom House. J. E. Peterson, “The GCC States: Participation, Opposition and the Fraying of the Social Contract” (London: London School of Economics, Kuwait Program on Development, Governance and Globalization in Gulf States, 2012); Matthew Gray, “A Theory of ‘Late Rentierism’ in the Arab States of the Gulf” (Scholarly Paper, Doha: Georgetown University Center for International and Regional Studies, 2011). Krane, “Political Enablers of Energy Subsidy Reform in Middle Eastern Oil Exporters”; Jim Krane and Elsie Hung, “Energy Subsidy Reform in the Persian Gulf: The End of the Big Oil Giveaway,” Issue Brief (Houston: Baker Institute for Public Policy, Rice University, April 28, 2016), http://www.bakerinstitute.org/media/files/research_document/0e7a6eb7/BI-Brief-042816-CES_GulfSubsidy.pdf; Glada Lahn, “Fuel, Food and Utilities Price Reforms in the GCC: A Wake-up Call for Business,” research paper (London: Chatham House, June 2016), https://www.chathamhouse.org/sites/files/chathamhouse/publications/research/Food%20Fuel%20and%20Utilities%20Price%20Reforms%20in%20the%20GCC%20A%20Wake-up%20Call%20for%20Business.pdf. Vivian Nereim, “Saudi Arabia Begins Payouts to Buffer Belt-Tightening Blow,” Bloomberg, December 21, 2017, https: //www.bloomberg.com /news /articles /2017-12-21/saudi-arabia-begins-payouts-to-buffer-belt-tightening-blow. Krane, Energy Kingdoms: Oil and Political Survival in the Persian Gulf. Brad Bourland and Paul Gamble, “Saudi Arabia’s Coming Oil and Fiscal Challenge” (Research report, Riyadh: Jadwa Investment, 2011); Heidy Rehman, “Saudi Petrochemicals: End of the Magic Porridge Pot?” (Citibank research report, Dubai: Citi Equities Research, 2012). Glada Lahn and Paul Stevens, “Burning Oil to Keep Cool: The Hidden Energy Crisis in Saudi Arabia” (London: Chatham House, 2011); Glada Lahn, Paul Stevens, and Felix Preston, “Saving Oil and Gas in the Gulf” (London: Chatham House, August 2013); Krane, “Guzzling in the Gulf: The Monarchies Face a Threat From Within”; Krane, “Stability versus Sustainability: Energy Policy in the Gulf Monarchies,” 2015; Jean-Francois Seznec, “Saudi Energy Changes: The End of the Rentier State” (Washington: Atlantic Council, March 2016), http://www.atlanticcouncil.org/images/publications/Saudi_Energy_Changes_web_0323.pdf. Although my work does cover this issue. 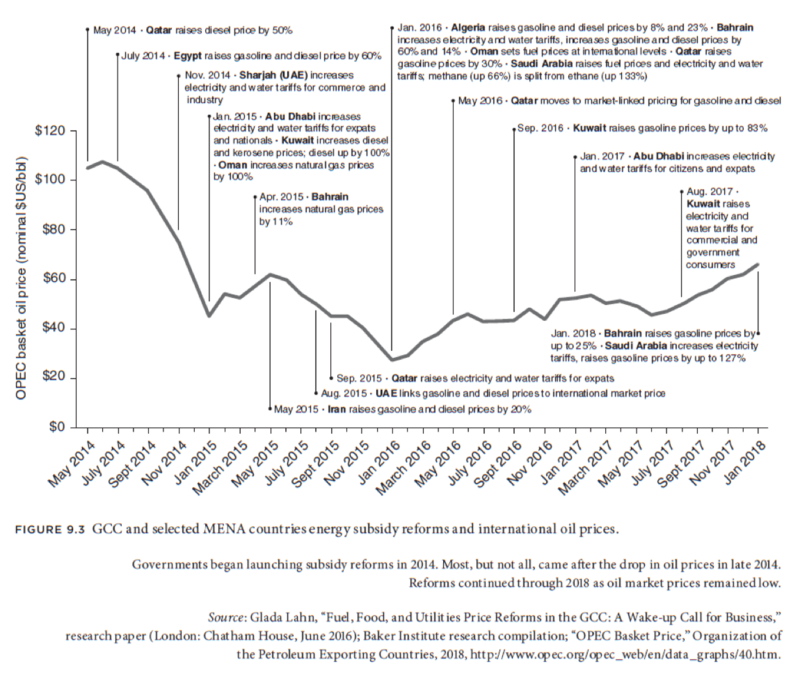 See: Krane, “Stability versus Sustainability: Energy Policy in the Gulf Monarchies,” 2014. Tsai argues that the subsidy portion of the social contract is being shifted to the state employment sector, where premium salaries and benefits continue to be available for citizens. 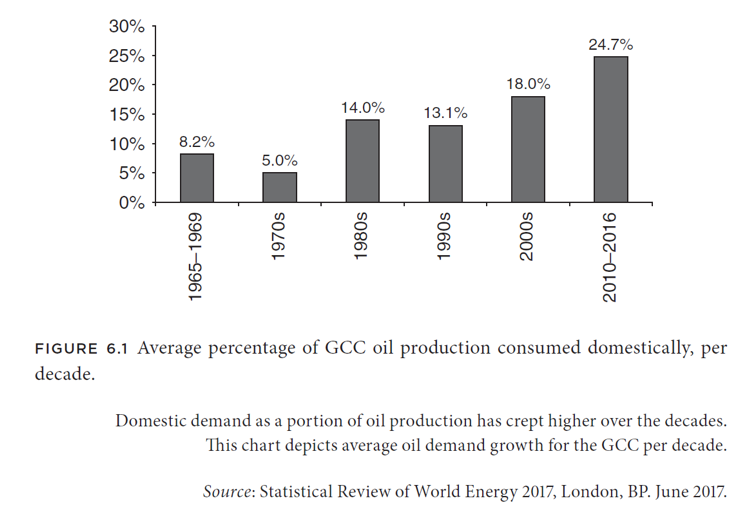 I.-Tsung Tsai, “Political Economy of Energy Policy Reforms in the Gulf Cooperation Council: Implications of Paradigm Change in the Rentier Social Contract,” Energy Research & Social Science 41 (2018): 89–96, https://doi.org/10.1016/j.erss.2018.04.028.